The Dunedin Chinese Garden uses authentic Chinese materials crafted by a team of artisans/craftsmen from Dunedin's sister city of Shanghai. In addition to the hand-made wooden buildings, the Garden features hand-made tiles, bricks and lattice-work and hand-finished granite paving stones. 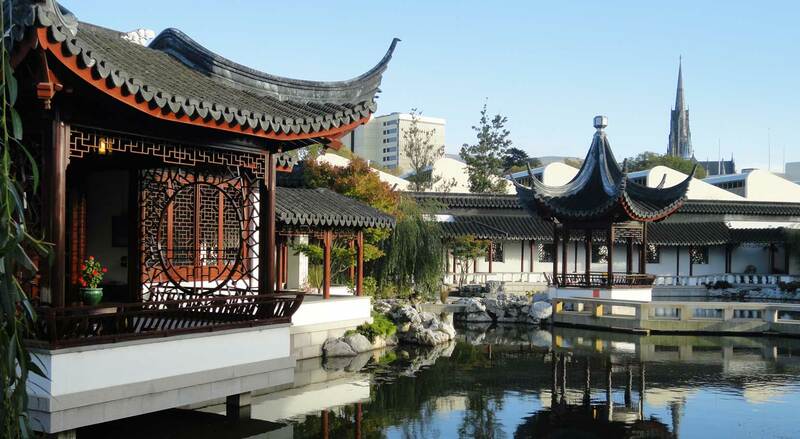 During the Ming dynasty, Chinese scholar’s gardens were an art form that flourished in China. Making one of these gardens was the preferred leisure pursuit of the scholar class, a way of creating a spiritual retreat from the stresses of worldly concerns. To build a garden, it wasn't as simple as you'd think. A scholar had to understand feng shui, hydraulics, philosophy, history, literature and architecture. The garden was a showcase of the scholar’s knowledge, a platform for his personal taste and, more importantly, a spiritual interpretation of nature. You may not have noticed, but at the end of the double corridor at Dunedin Chinese Garden, there is a scholar’s study tucked around the side. This secluded area is the quietest and most serene part of Chinese scholar’s gardens. The study is an important part of an authentic Chinese garden, as it serves as the sanctuary for the master of the house. It was here the scholar would spend his time writing poetry and music, practising calligraphy, painting and studying, all in an environment that encouraged contemplation. These were considered to be the hallmarks of proper nobility. The garden served as the perfect setting for entertaining important guests, and was also a sign of social status.